USFA rejects the ‘Sydney Marine Park Proposal’ What you can do to Help. Please see the attached documentation regarding the USFA's position on the Sydney Marine Parks, information on each proposed site and what you can do to help stop it. USFA members what to do - What you need to do. USFA recommendations HBRMP - This is the USFA's position on each proposed marine parks. PETITION_MARINE PARKS - Please complete as many petition sheet as you can and return to the address listed on the bottom. Following an official complaint made to the Department of Primary Industries about a false statement made in the Hawkesbury Shelf Bioregion Assessment concerning spearfishing, Mel Brown has gotten an apology on behalf of spearfishing. 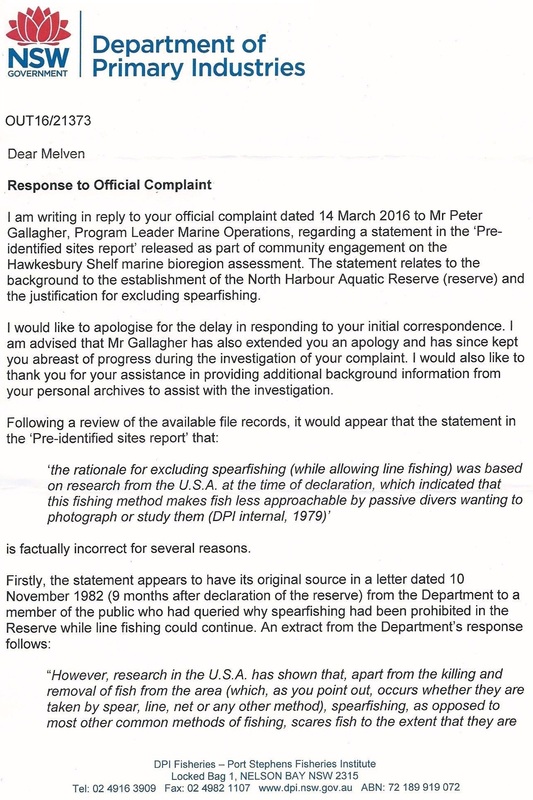 Attached are copies of correspondence to Peter Gallagher and Minister Niall Blair concerning a false statement that appears in a document of the Hawkesbury shelf Bioregion. Peter Gallagher has neither acknowledged receipt of this document or responded to it. Previously the reasoning for excluding spearfishing from the North Harbour Aquatic reserve whilst continuing to allow other forms of recreational fishing was only made in correspondence to the USFA. To now see this claim, which was utterly false, appearing in print necessitates the strongest possible response. There was, and never has been, a legitimate reason to exclude spearfishers from this reserve where other forms of fishing are allowed. As the elected President of the Underwater Skindivers & Fisherman’s Association, I feel it is important to inform you of my concerns. 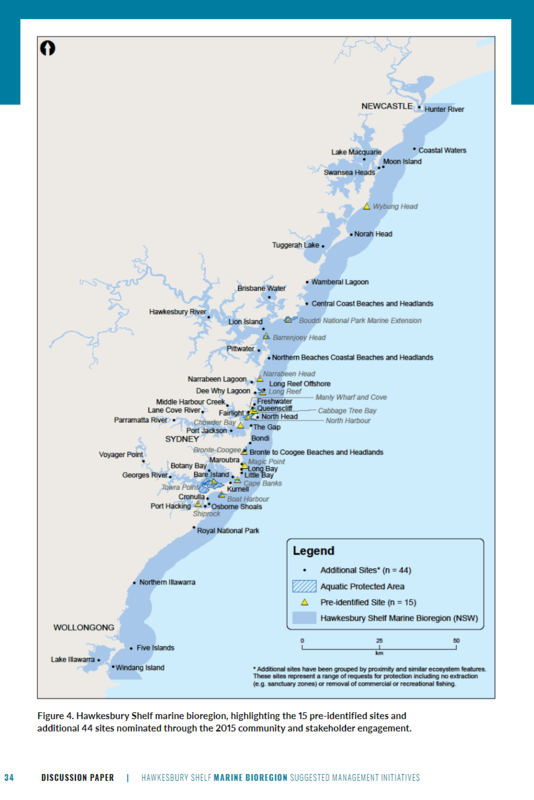 Once again there is another campaign, “Hawkesbury Shelf Marine Bio- Region” attempting to exclude fishers from our traditional grounds between the NSW Central Coast and Wollongong. The USFA is proud of its long and strong culture of conservation and co-operation, and as such, we are perplexed at how this lock out of fishers will achieve any of the objectives expected. Our Association believes in the wise, ethical and sustainable use of our marine resources. We believe that this approach along with adaptive management practices is the preferred option rather than a failing protectionist one. The loss of access to key fishing locations is not conservation or management based, there will be little if any increase in overall abundance and there will be little increase from spill over or recruitment. There will also be increased effort in the remaining areas with the resulting decrease in bio mass and in catch. We would also expect an increase in conflict between the different stakeholder groups as we are forced into smaller areas. The safety aspect should also be of consideration, it is our fear that there would be an increase in risky behaviour and accidents, as fishers will be forced into taking greater risks. For the USFA, there is also the concern that divers will be forced into deeper waters as the proposed exclusions take a proportionally larger part of our access, which is water 20m or less in depth. The basic principle of adaptive management is to monitor trends in abundance and react to this. The USFA is well aware of this, to the extent that we developed our own indices “The USFA Index” to record and measure these trends. As our effort and technology (breath hold, rubber powered guns, etc.) has seen little change in the last 60 plus years, the rigour of our “catch per unit of effort” is now the bench mark for monitoring fish trends. This is used by the CSIRO and also provides our association with an income. There is no other baseline for measuring the trends in fish abundance extending back for 50 years. The lockouts would in effect make these indices redundant and we all would lose this most rigorous monitoring method. This proposed exclusion is the inverse of good management and conservation. Fishers have always been very compliant and we feel that the best way to achieve conservation and sustainable outcomes is not by exclusion, but inclusion. Our marine heritage is valuable and important to us, and as such we have a strong interest in protecting it. Why exclude us? We have accepted licencing, size and bag limits and a multitude of exclusions already, and will continue to do so. It would appear that these lockouts are not about conservation or sustainable use, but to suit the agendas of relatively small and vocal interests. Some stakeholders such as SCUBA, would effectively gain the exclusive use of this public resource. As fishers we are not seeking exclusive use, we are happy to share. 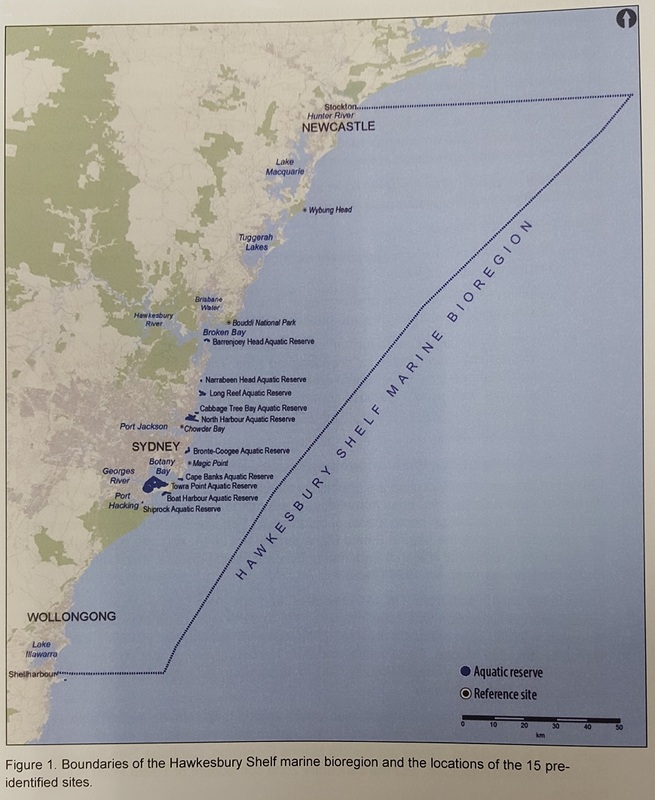 In closing Minister, I put it to you that the “Hawkesbury Shelf Marine Bio-Region” proposal is the agenda of a few, not the majority of stakeholders. I would also like to make you aware of the cultural importance of these proposed sites to spearfisher’s, they include the location where 68 years ago spearfishing as a sport was founded in Australia. I ask you not to exclude those who wish to continue to use this resource wisely. Together we have the ability to manage this resource sustainably. Please don’t lock us out. I am writing to lodge an official complaint re a statement in one of the Hawkesbury Bioregions accompanying documents “Review of 15 Pre – identified Sites”. If you are not the appropriate person to deal with this complaint could you please advise ASAP. On page 34 which deals with the North Harbour Reserve it justifies the lock – out of spearfishers with this statement “Rationale for excluding spearfishing was based on research from the U.S.A. at the time of declaration (1982) which indicated that this fishing method makes fish less approachable by passive divers wanting to photograph or study them (DPI internal 1979)”. This statement is a little milder than that made in writing in correspondence from B. Lynch for G.H. Knowles Director General Department of Agriculture to George Davies (Federal Secretary of the Australian Underwater Federation) dated 29th October 1985 – “The rationale for excluding spearfishing from the North Harbour Reserve is based on studies conducted in the United States of America which has shown that spearfishing, as opposed to most other common methods of fishing, scares the fish to the extent that they are no longer readily approachable by divers wanting to photograph or study them”. This statement was fraudulent and dishonest then and remains fraudulent, dishonest and misleading to this day. On receiving a copy of the above correspondence I queried the validity of this statement in correspondence to George Davies dated 29th November 1985 as I had copies of all known spearfishing studies and immediately suspected this statement was false. George Davies again wrote to the Director General (undated, copy received by me on 5/2/86) requesting a copy of this “study” to enable us to determine its relevance to Australian conditions. 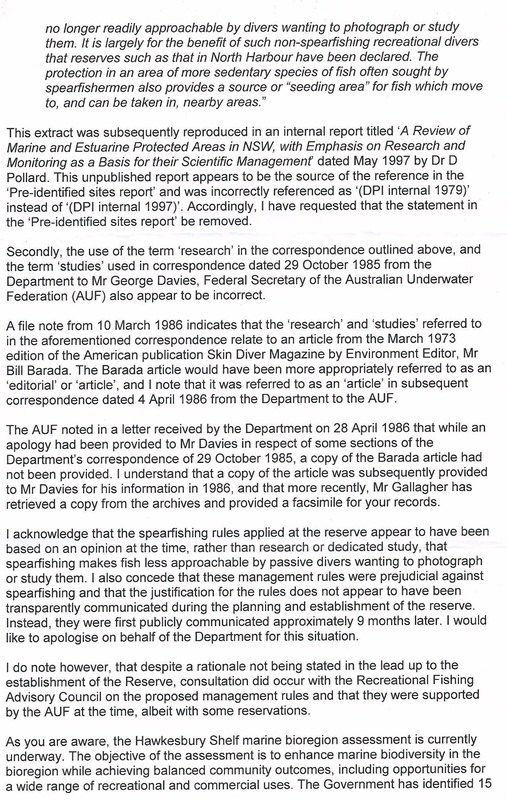 Following a meeting of the Recreational Fishermen’s Advisory Council George Davies received a verbal apology from Dr. Peter Ayres, Director of Fisheries for “some sections of the previous letter (29/10/85” however this was never put in writing and no copy of the “study” was produced, prompting another written request. George Davies wrote again on 17th June 1986 after finally receiving a copy of an article concerning spearfishing in the United States of America. He said in part “In referring to this particular letter (29/10/1985) I find the information therein extremely misleading and inaccurate”. The “study” had turned out to be nothing more than an article published in the American magazine “Skin Diver” by Bill Barada concerning the neglect of the John Pennekamp State Park and voicing a personal opinion as to spearfishing by the author. To construe this article as a “study” or having any scientific validity is quite simply reprehensible. At this particular period of time spearfishing with Scuba was (and still is) extremely prevalent in the U.S.A., whilst spearfishers in NSW had been pro-active in ensuring Scuba spearfishing was prohibited thus providing a depth sanctuary, an initiative that has been extremely successful in conserving shallow water species. These facts never received any consideration, nor was any expert advice sought from spearfishing representatives in NSW. An underwater photographer’s biggest problem when photographing fish is the noise his Scuba makes, both on inhalation and exhalation. This is what scares Fish! And this is why professional photographers employ breath – hold diving techniques or use Re – breathers when taking fish photo’s. The whole art of successful spearfishing is to be able to approach fish without scaring them. The argument that fish are so scared by spearfishing that they are not approachable by other divers is ridiculous and once more evidence of prejudicial treatment by the Department. 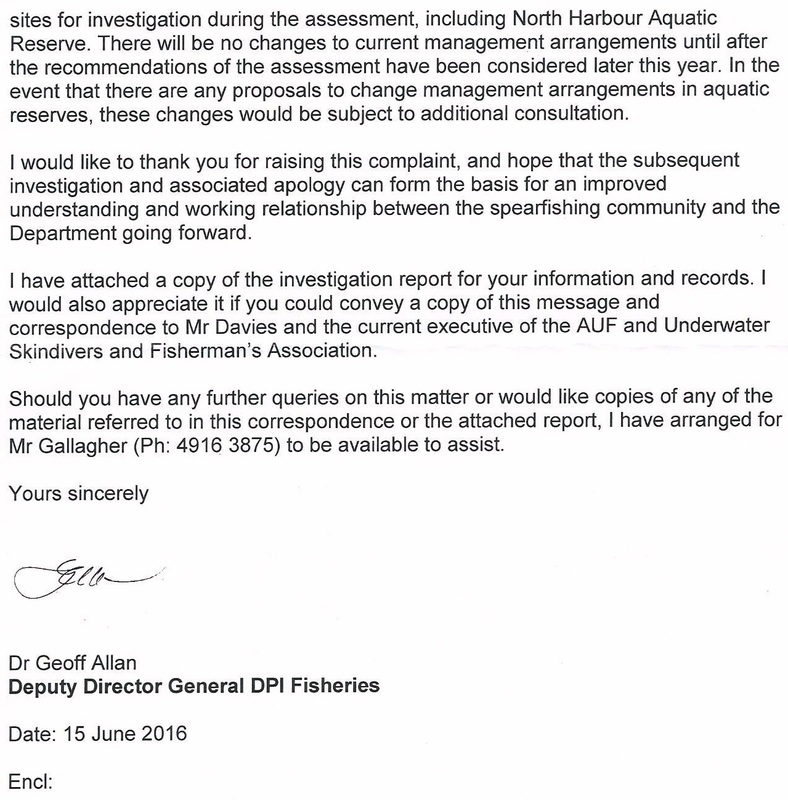 I have several times found it necessary to accuse NSW Fisheries of prejudice when dealing with spearfishing matters. This has always been denied but there is no clearer case of prejudice than what has occurred with the locking – out of spearfishers from the North Harbour reserve. An opinion, judgement or evaluation conceived without proof or competent evidence, but based on what seems valid to one’s own mind. To be frank I am thoroughly disgusted that after all the correspondence from us concerning this issue, a statement that was corrupt and malicious and injurious to our fishing method is still persisting. My last correspondence on this issue was to the Manager, Protected Areas on 15th May 2001. One of my greatest concerns with my many dealings with Fisheries over the years is their inability to be frank and honest and to admit to mistakes and rectify them. The same applies equally to governments (of all persuasions). My writing to you is just the first step. I am quite prepared to take this as far as necessary to have this injustice rectified. Could you please advise as a matter of urgency your department’s intentions regarding a resolution? On the 15th August Mel Brown, USFA Executive from 1971 to 2007, Life member and Historian, sent a submission to the Committee on Recreational Fishing in the Legislative Council, Parliament House. In brief the submission highlights that despite how selective and sustainable spearfishers are and how much scientific data we contribute we have little to no representation on marine park advisory committees. Mel goes on to suggest that the USFA should have a representative on each marine park advisory committee. There is a fair bit more to the submission so take the time and give it a read. On behalf of all spearfishers the USFA thank him very much for looking after our interests on the political side. Good evening everyone, thank you all for coming tonight. Many of you already know me. For those who don’t, I started spearfishing 35 years ago and joined my first hunting club at the same time. I fished the Alliman Shield for 16 years and whilst I was never a successful comp diver, I managed to fluke a few good fish along the way. Fifteen years ago I was involved with the foundation of a recreational fishing lobby group, Angler’s Action group and have been elected to the committee since. Currently I have been honoured by being selected as a mentor for the Future Leaders program for the Recreational Fishing Alliance.